Welcome Bees Knees Boutique and Two Twisted Gypsies! First of all, happy October! Such a comfy cozy and fun time of year and I love all things fall! What makes this October even more amazing is that I am welcoming two new local artisans to Reclaimed Rose! I am so excited to expand with more amazing handmade pieces! 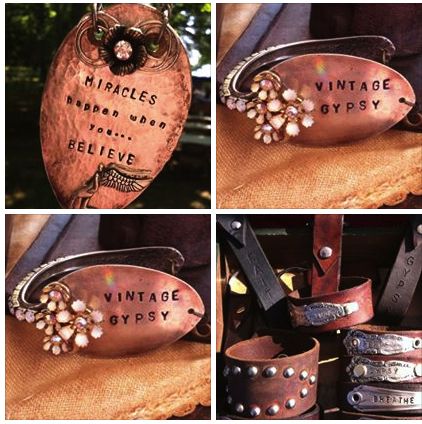 The two new artisans are Chanie Danks with Bees Knees Boutique, specializing in hand knit and sewn clothing and accessories and Two Twisted Gypsies, a husband and wife team of Michelle and Brian Tice, who create amazing one of a kind accessories from vintage jewelry and found objects. Chanie can make custom creations, perfect for Halloween, the upcoming holidays and children's birthdays. This busy mom has been creating things for the shop, only to have people trying to purchase her work before she can even get it on the shelves! I cannot wait to see her cute creations at Reclaimed Rose. Brian and Michelle are also offering custom pieces, which you can have hand stamped and designed just for you! Please stop in and check out the Gypsies display next week - the entire display piece was hand made and is beautiful! Two Twisted Gypsies and Bees Knees Boutique are expected to be in store by Tuesday, October 6th! More pictures and posts to follow!